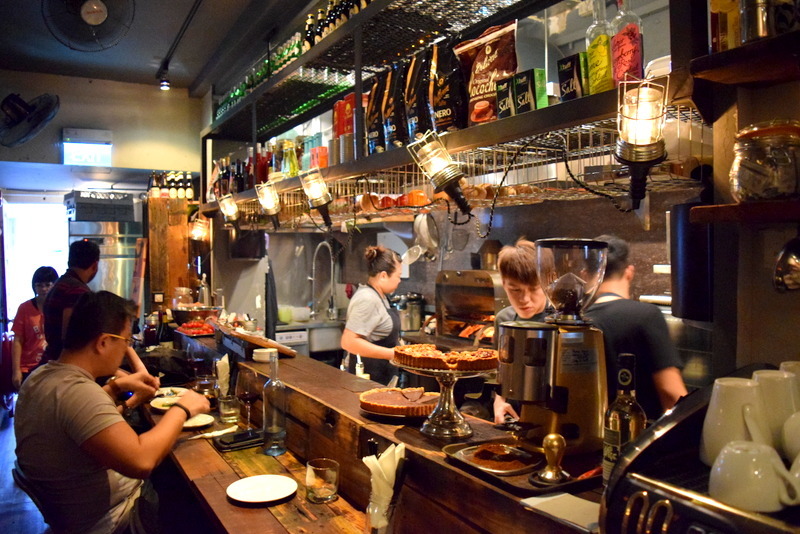 English (Singapore) – Simply foodolicious! おいしい! 好吃! 맛있는! délicieux! delicioso! 好食! 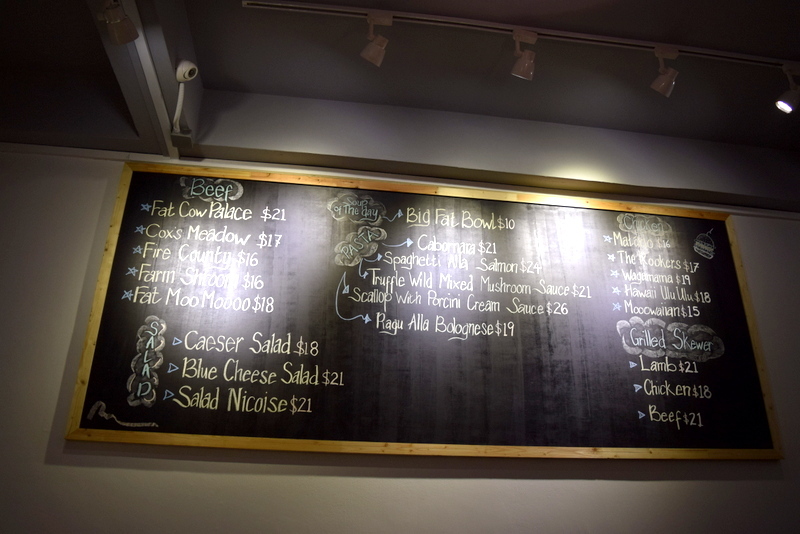 House – A revamped menu! My third or fourth time to House for the revamped menu, and I am pretty sure of their creed now – to serve up hearty, whomesome food that is comforting to the soul, with the use of heavier tasting ingredients and sauces. It may sound like a meat heaven and a vegetarian hell but is actually just as exciting for vegetarians, as could be seen from this beautiful plate of Rigatoni. Baked Pumpkin and Goat’s cheese Rigatoni – Sauteed with the luscious sweet pumpkin with fresh sage leaves, made fuller with goat’s cheese and almond amearetti. $23. Not the dainty type of vegetarian? And hope to have a bigger heartier meal, then the Portobello Schnitzel Bun could be the one. This huge dense portobello with a meaty taste and mouth-feel, is nicely breaded for that delicious crust and slathered with spicy mayo, made even heavier tasting with the provolone cheese, all contained in that healthy Arugula bun. Yes, and there we go, sweet potato chips by the side. $28. Broccoli, Quinoa and Pom Pom salad – Super leaves, nuts and sprouts, tossed with Quinoa, broccoli and coriander and that thick refreshing pomegranate raita sauce gave the dish a fuller body. $18. Baked Scallops on Shell – Seared Hokkaido Scallops, spiced with Mediterranean eggplant zaalouk, topped with Spanish Crumbs. $24. Bacon & Egg in a Naan Jam – Candied bacon topped with a super runny sunny side up (my yolk came out orangy red, how nourished could that be), paired with the spicy tomato jam and cream cheese. Very high calorie dish but that creamy New Zealand yolk sealed the deal for me. $22. 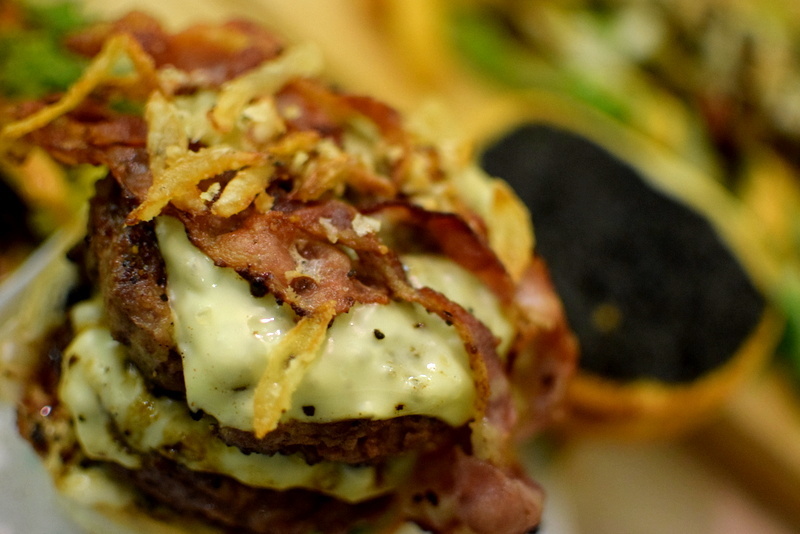 Bone Marrow and Steak burger with Bacon Jam – A plump slab of steak patty, made even crazier with bone marrow between the brioche buns that are further topped with onion rings and provolone cheese. $29. With so many heavy tasting ingredients utilised, the overall taste is indeed quite vivid. Stinky meets Crispy Chicken Waffle – Har Cheong Gai sitting on that rich rice flour waffles that is given a witty spicy punch with that innovative sambal maple syrup. It might be the most Asian savoury waffles that I’ve seen and that combination works. Meant to be consumed warm though as the waffle turns harder when it’s left to rest for too long. $24. The newly revamped House menu, as yet again! 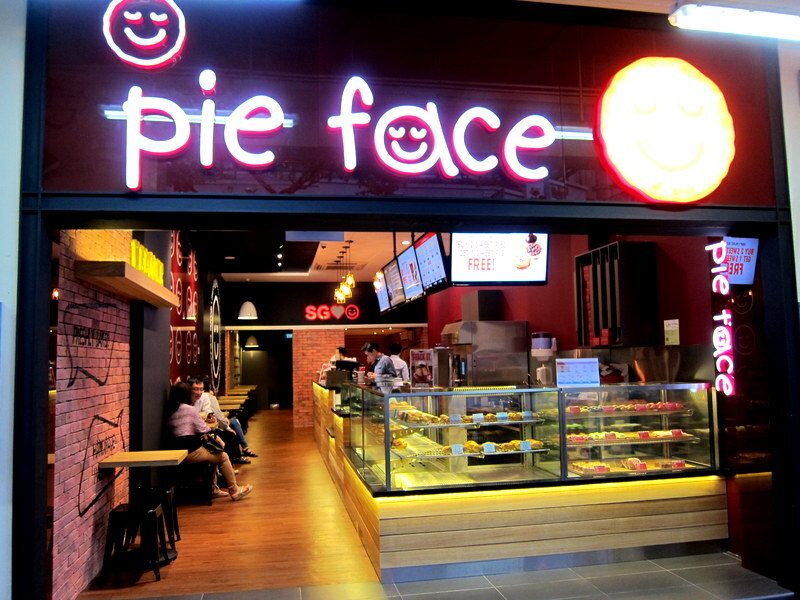 Pie Face – Australia’s Pie Face sets foot in Sg! First in Asia! 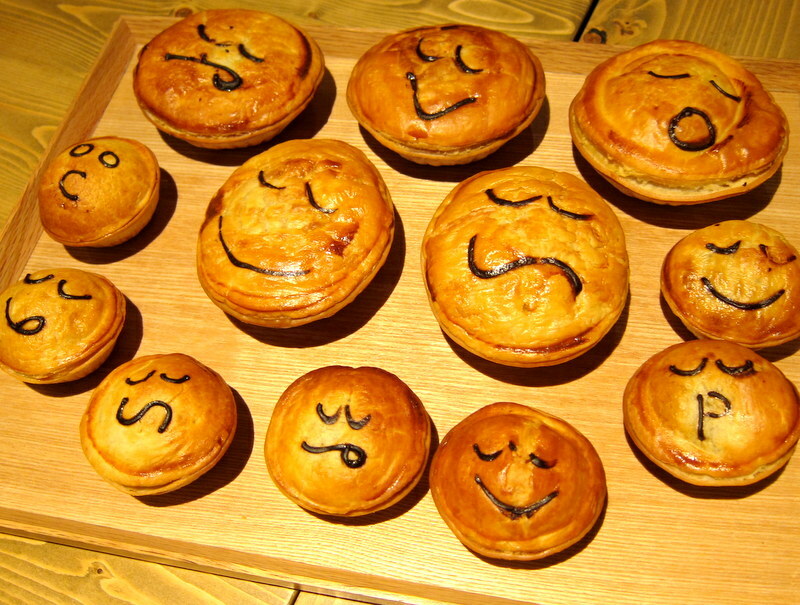 Gimmicky as it may seem, pie face does indeed help to enliven you after a hard day! And Let’s admit it, these pies are definitely Instagram-worthy and most wouldn’t be able to resist a shot! And yes you are right each facial expression represents a different luscious filling. A big range of pies are served here so herbivores, carnivores as well as dessert-lovers would definitely be able to pick their favourite! After being so successful in Malaysia, chef Eddie Soh, has brought it over to Singapore and opened his first branch at the Chinatown area. It may not be too busy on a Saturday night, but that is what I like about it, not overly crowded and rowdy, while you still get to enjoy good burgers and a relaxing meal. At slightly under $20, you could have a range of burger sets which comes with a side salad, a small bowl of wedges and a soft drink while the chief difference between the different sets – their toppings. As for your patty, either chicken or beef is served. 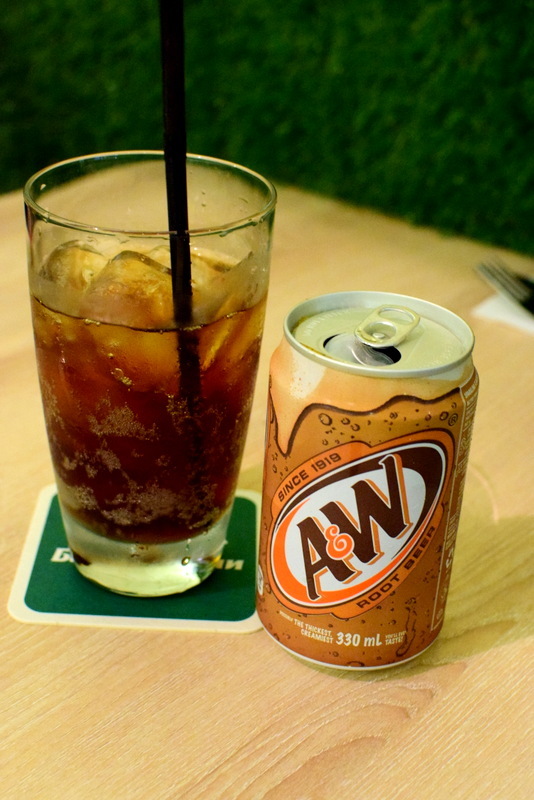 K and I both chose the now hardly seen A&W root beer. Haven’t had that in many years. 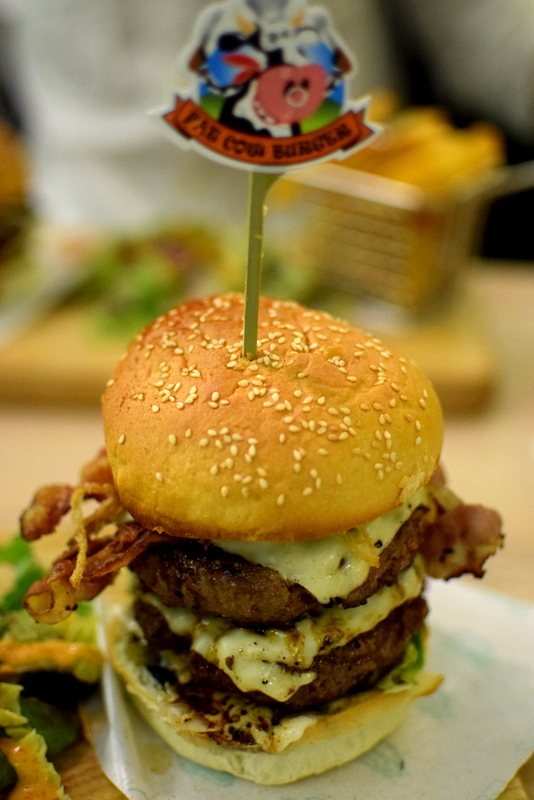 Got the fat cow burger set which has double patty intercalated with melted cheese and topped with bacon and fried onions. Super sinful but the juicy flavourful thick patty made the calories worth it while I love the crusty charcoal bun that has a super crispy outer layer. Very satisfying and definitely would fill up a hungry man. $21. 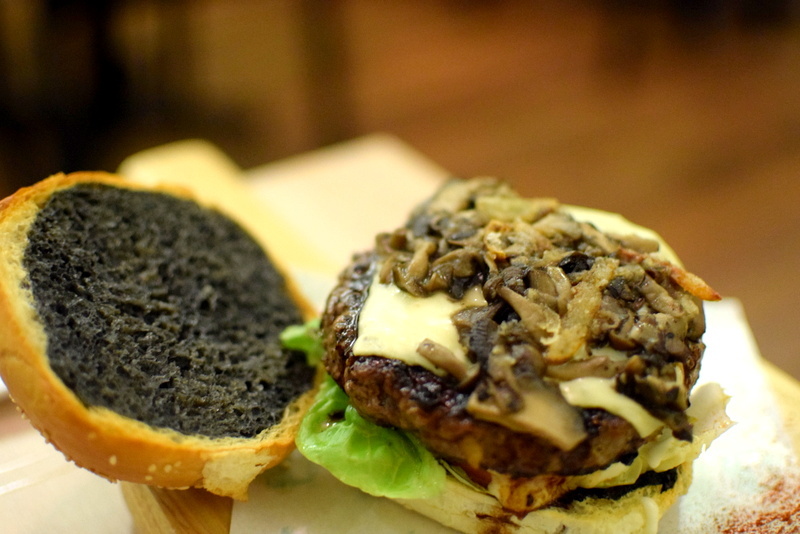 The other set ordered was the shrooms burger that has delicious glazed mushrooms laid on top of the patty. The mushrooms gives it an edge as it makes it even more fragrant. $16. And we both shared the chicken skewer for $18. It tasted a little like kebab and was not bad but I thought for the price, we could have ordered the chicken burger instead. So Fat Cow Palace did satisfy though I guess I would still prefer potato head. 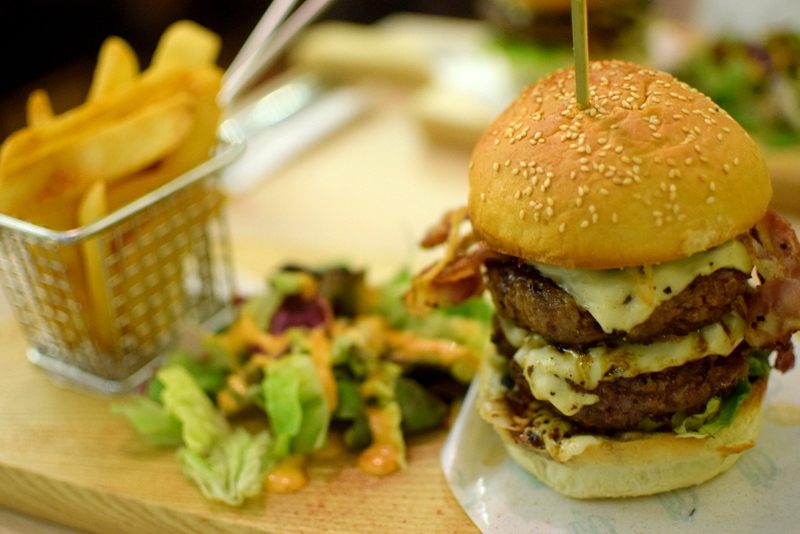 While potato head mainly focuses more on their sauces and tries to make burgers that are slightly less conventional, Fat Cow Palace serves the traditional kind of hearty meaty burger that would definitely not go wrong. Still, it is a good meal and I especially love the fluffy charcoal bun that makes this otherwise conventional burger stand out. Yums. 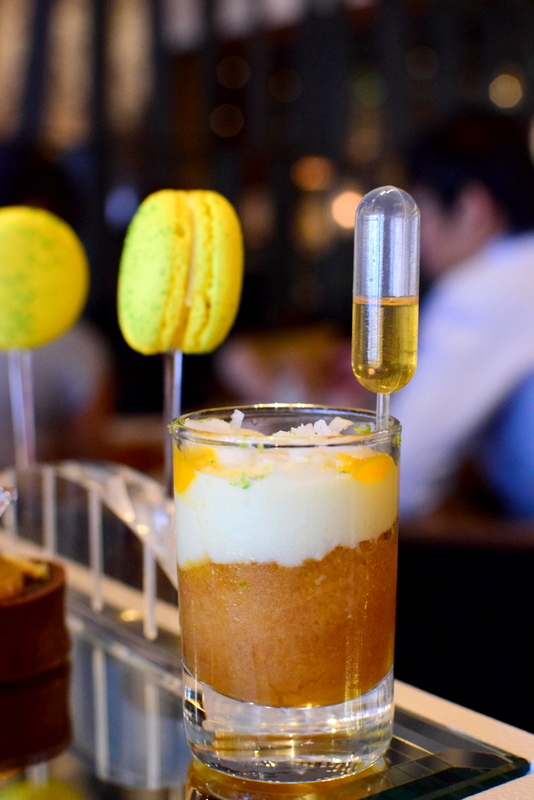 And after such a long search for a really good high tea, I may have finally found one – that is Antidote at the newly refurbished Fairmont Hotel. 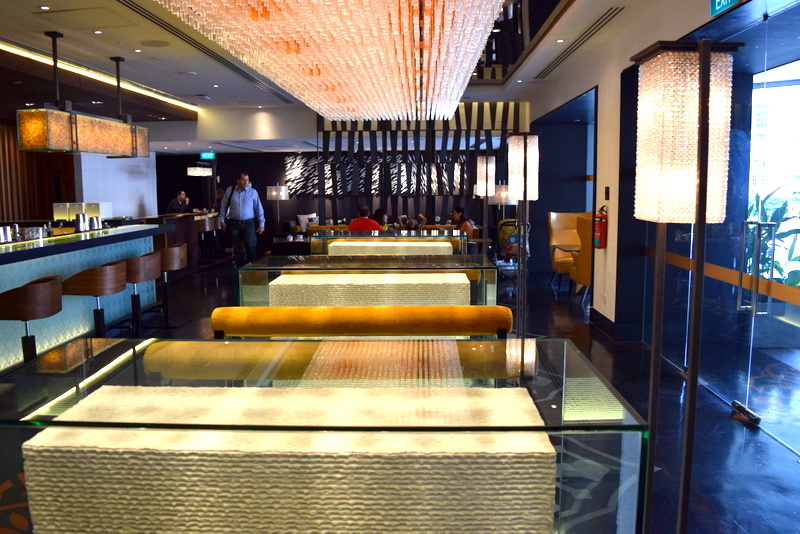 Elegant, plush and chic is what this restaurant could be simply be described as. 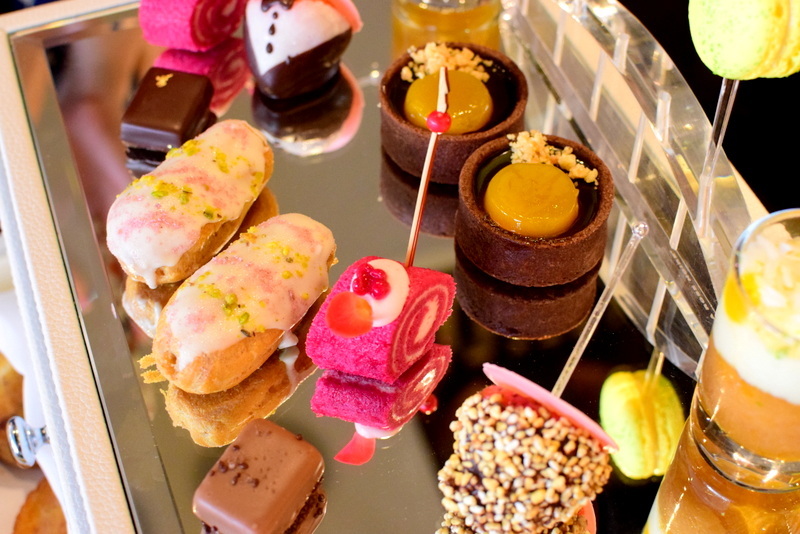 Known for their cocktails, the quality of their high tea is also one that has to be reckoned with. 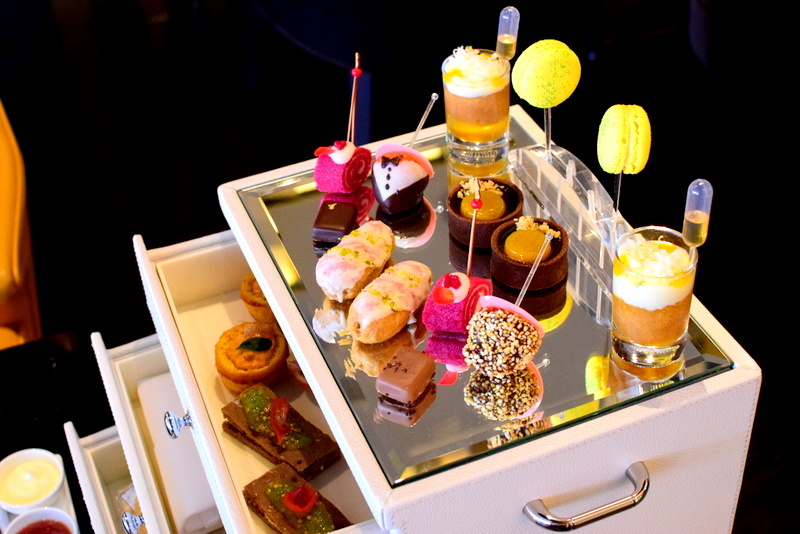 Not only is the presentation unique and lovely (as they come in a chest of drawers), the savouries and sweets are all almost memorable. This is indeed one of the best high tea places in Singapore, or perhaps even the best in my opinion! 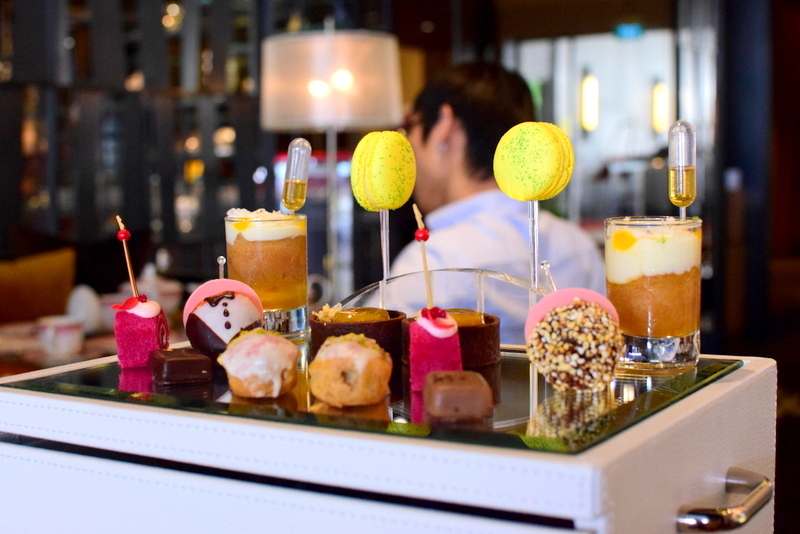 At $38, this high tea is definitely a steal. 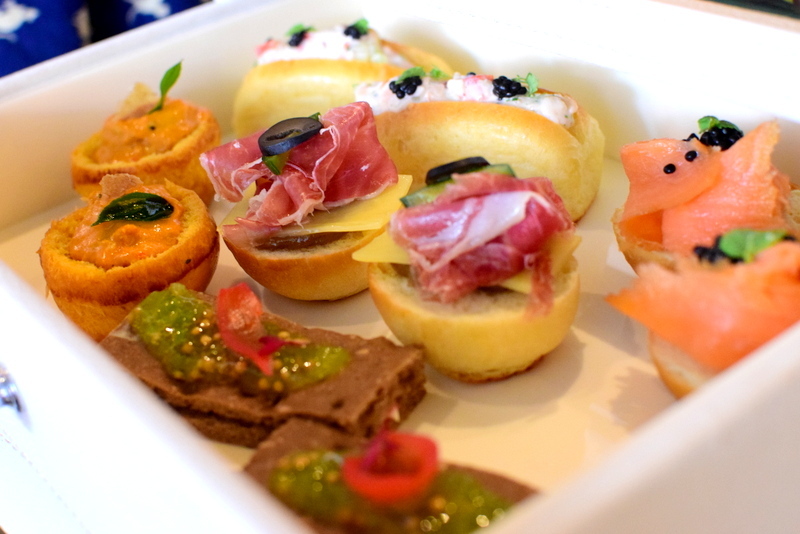 You get to choose a more chinese set of high tea or a more western one and the only difference lies in the starters. 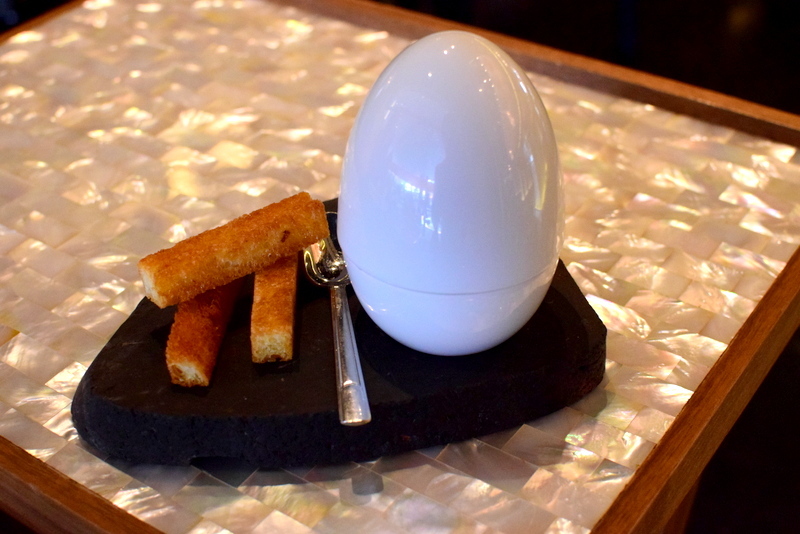 While the Chinese serves a dim sum platter, the English one has truffle scrambled egg with some sticks of fried bread to go with it. Q and I both got the western one and here we go, the gem within the plastic egg. Upon opening, you could immediately smell a really strong truffle aroma and that goes really well with scrambled eggs. 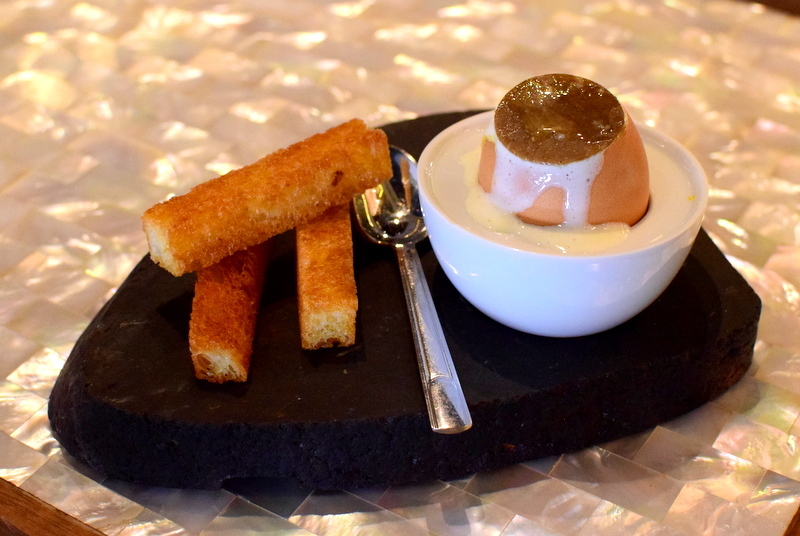 Love the creamy texture of the egg when eaten together with the bread sticks. Btw, the black top is a piece of truffle. And the lovely chest of high tea came. Very beautiful definitely and the quality of every snack is so good. 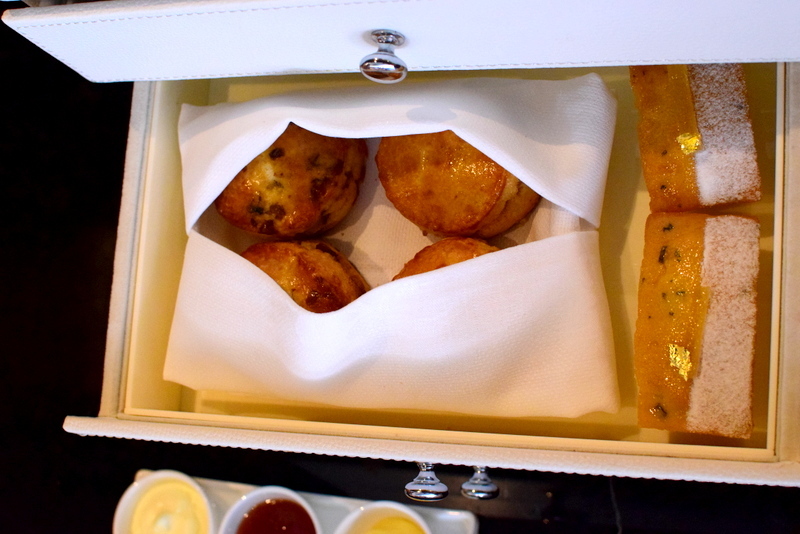 The first drawer consists of the savouries which are so well done. You get the smoked salmon with caviar; boston lobster roll; cucumber and dill salad with cream cheese; Prosciutto with cameralised onion and coronation curried chicken. Everything was spot on but the cucumber and dill salad sandwich was the one that caught my attention as it is usually just a slice of cucumber in most hotel high tea but the one over here was so meticulously made. I also love the taste of the prosciutto with the sweet caramelised onions underneath, delicious! 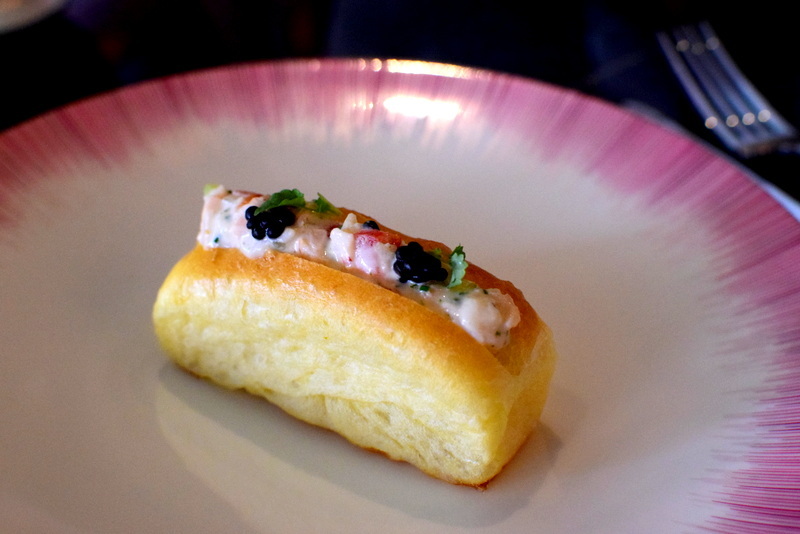 Took a cute picture of the lobster roll with caviar. Lemon pound cakes with gold leaves which are still moist within while ginger and raisin scones were served as well. 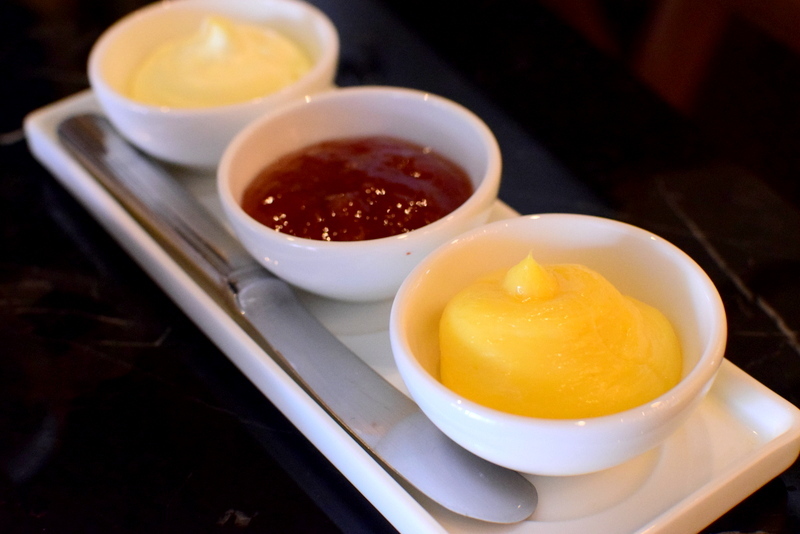 Especially love the lemon curd over here in addition to the traditional clotted cream and jam as it somehow has a slight yuzu taste in it. Delicious when eaten with the warm scones. And the topmost tier were the petite desserts. Strawberry gateau with raspberry and lychee pearl was so soft and not overly sweet while the earl grey eclair tasted really fragrant as well. Chocolate tart has this refreshing sour gelatin-like thing on top of it and that complemented the thick chocolate really well. Yuzu macaroons had the right texture but I thought could have a stronger yuzu punch! A front view of the top tier. 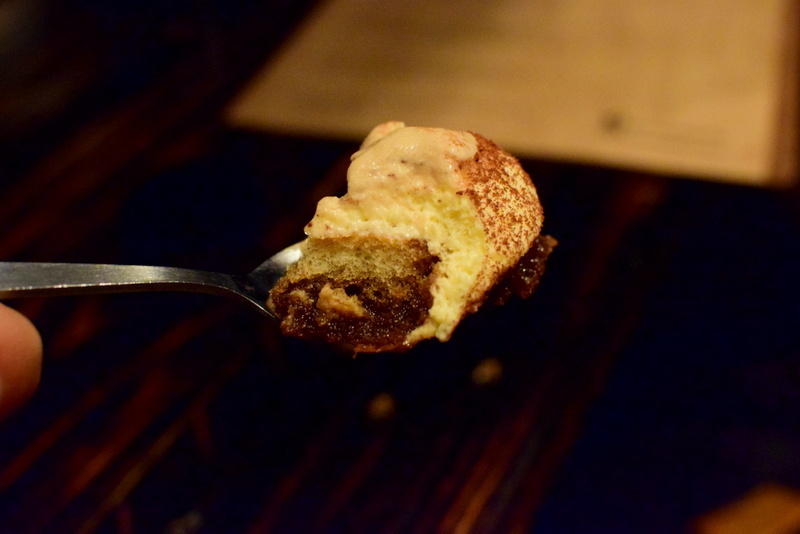 And this antidote rum baba was really cute. Filled in the pipette is rum and if you think the alcohol content in the glass of coconut heaven is not strong enough for you, then just squeeze the pipette. Despite not having any refills, we were so stuffed at the end of the meal! And honestly, I have to admit that this is the first time that I would want to revisit the same place for an afternoon tea. Service is prompt and friendly as well and I especially love the fact that almost every snack has a French element in it. It is really that good and please reserve early as they seem to get full by mid week! Feels like a izakaya in Japan! Couldn’t have imagined but it’s really my first time going out with my ‘hipster’ parents to a bar in Singapore. 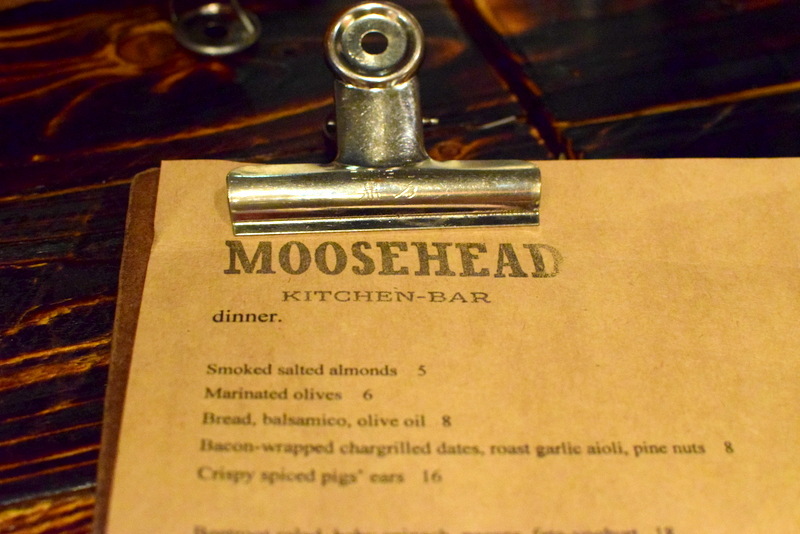 Chose Moosehead Kitchen as it is said to serve creative fusion dishes. You get sharing plates spanning from the familiar western salads to a Korean Bulgogi chicken as one of your mains. Such a fusion theme is pretty apparent by just looking at the cutlery holder (that contains chopsticks, fork, knife, spoon). 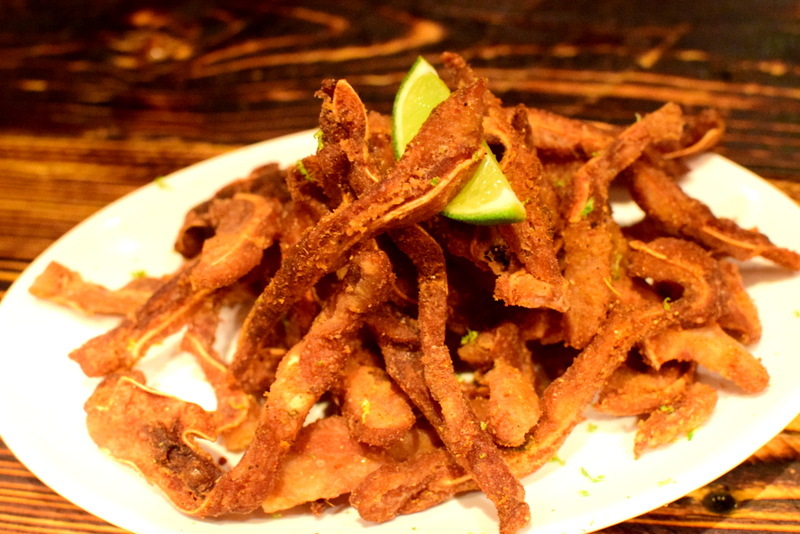 Crispy Spiced Pig Ears for $16. This is definitely a good, crispy snack to go with beer that is made fragrant by coating it with the Indian curry spices. I thought a bigger slice of lemon could be given to give it a more refreshing edge. Grilled Avocado, ajoblanco and salmon roe. $18. 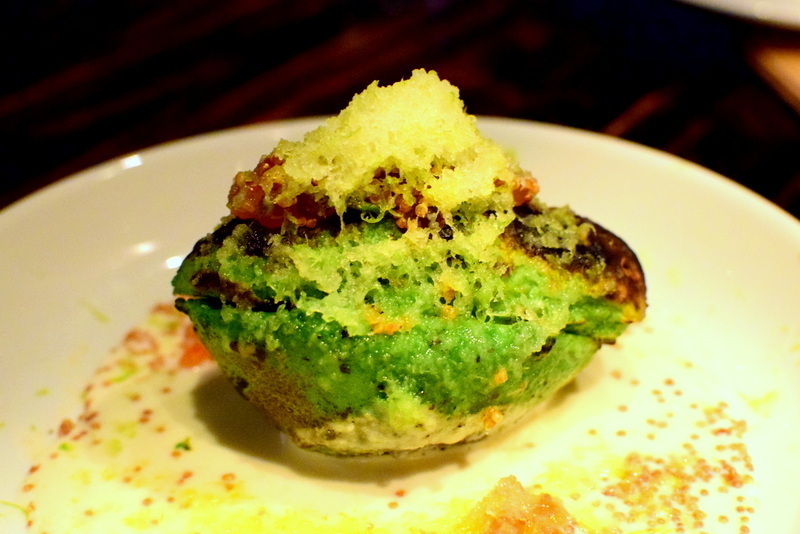 This creamy avocado tasted really well with the slightly salty salmon roe and creamy, tasty ajoblanco. Very interesting taste and choice of ingredients which seemingly do not have much relation with each other but still able to give an intriguing combination. Thought of skipping this appetiser initially but was lucky to have ordered it in the end as it was highly recommended by the waitress. 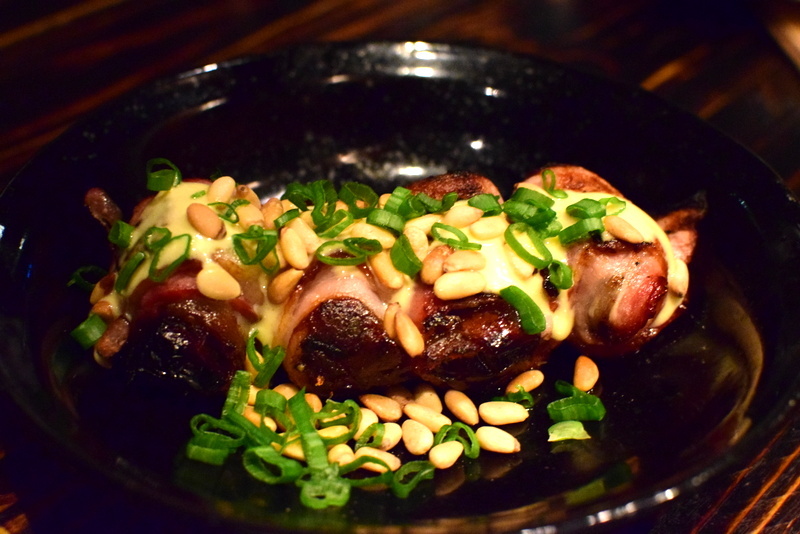 Indeed, this bacon wrapped char-grilled date is very delicious. Simple as it seems, the addictive texture of the dates together with the fragrance of the bacon makes this dish a winner. $8. Secreto iberico with tomato wasabi. While the pork was nicely grilled with the meat still feeling moist and savoury, I was actually more impressed with the interestingly concocted tomato wasabi sauce. 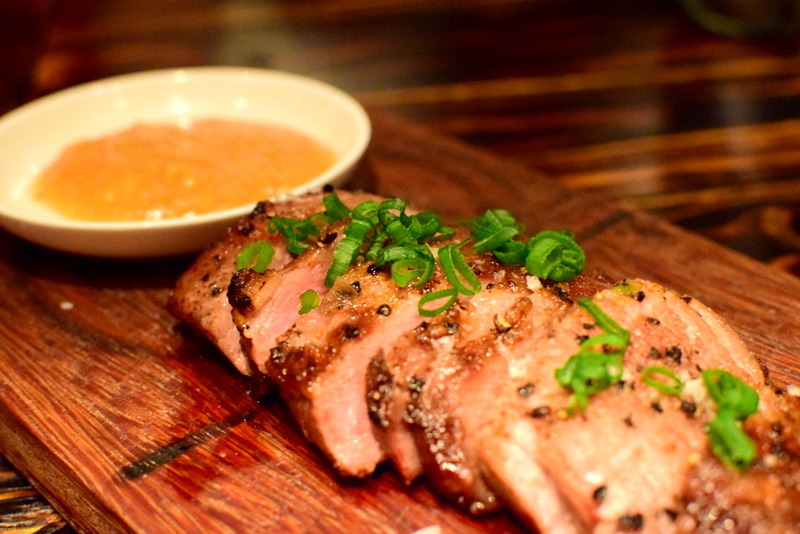 The pork was slightly salty and for the price of $28, this portion is really quite small. 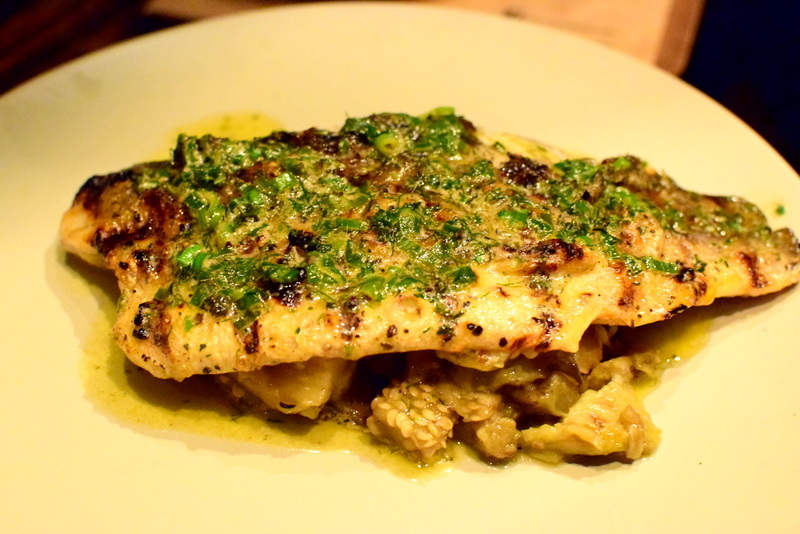 Grilled sea bass with eggplant caviar for $28. Moist slab of fish with a crispy fragrant skin – that really is all it takes to be a well grilled slab of fish. 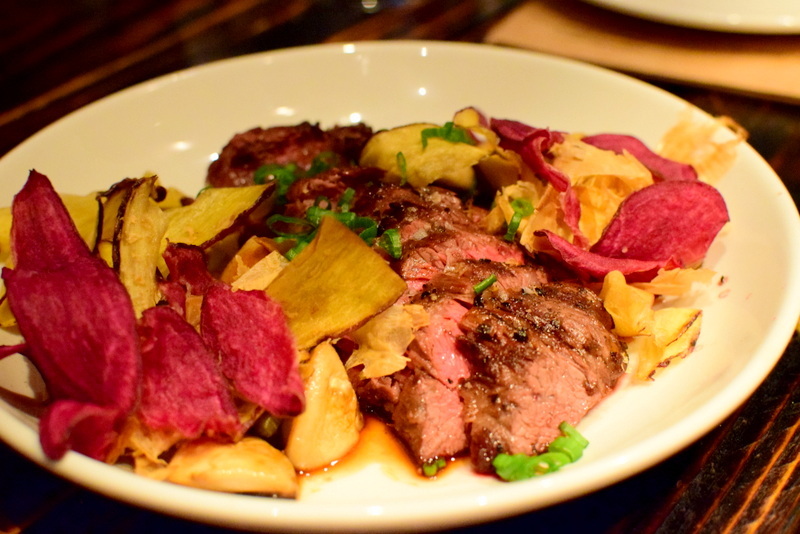 Love the softness of the meat and this tastes comforting with the soft eggplant underneath. Got the interesting beef cheek pau for $18. 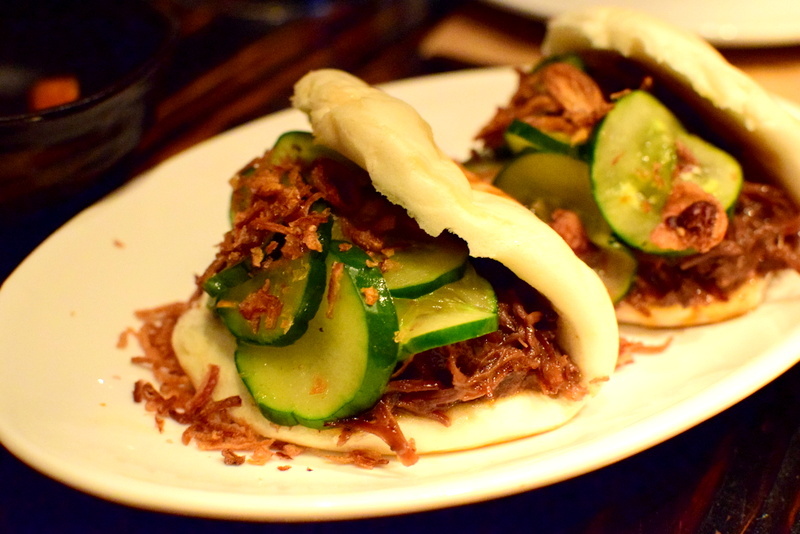 Pau is slightly grilled on the outside and I love that crusty texture that the pau has while the moist shredded beef cheek stuffed substantially within makes every bite really satisfying! There is also sambal chilli served at the side. Beef onglet with teriyaki mushrooms, fried sweet potato and bonito. $34. Beef slices were well grilled while still retaining its pink hue within. Interestingly, this is paired with thinly sliced fried sweet potato which tasted really fragrant while the teriyaki mushrooms are so delicious. An evident asian touch to an otherwise western food and I like the vibrant colours on this plate! Yummy tiramisu for $10. 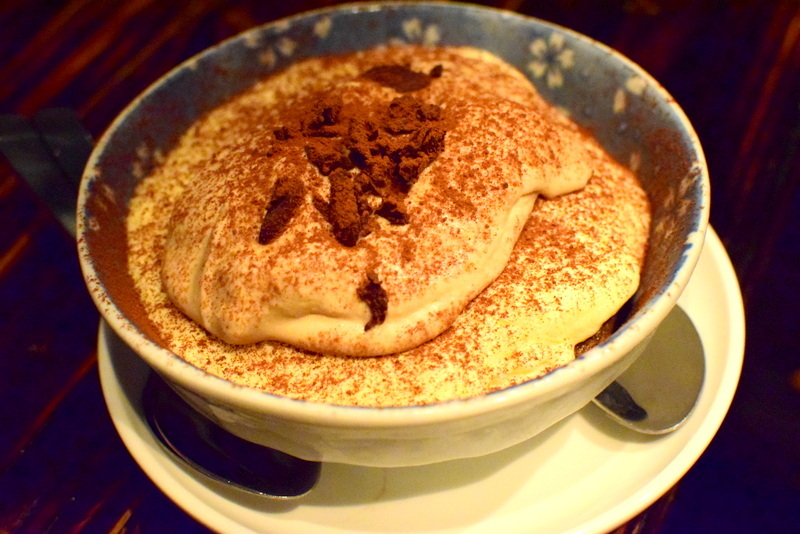 Love how this huge tiramisu is served in a bowl. Rich coffee infused sponge with a super creamy, smooth mascarpone and fragrant chocolate dusting, I could have finished this whole bowl on my own easily! 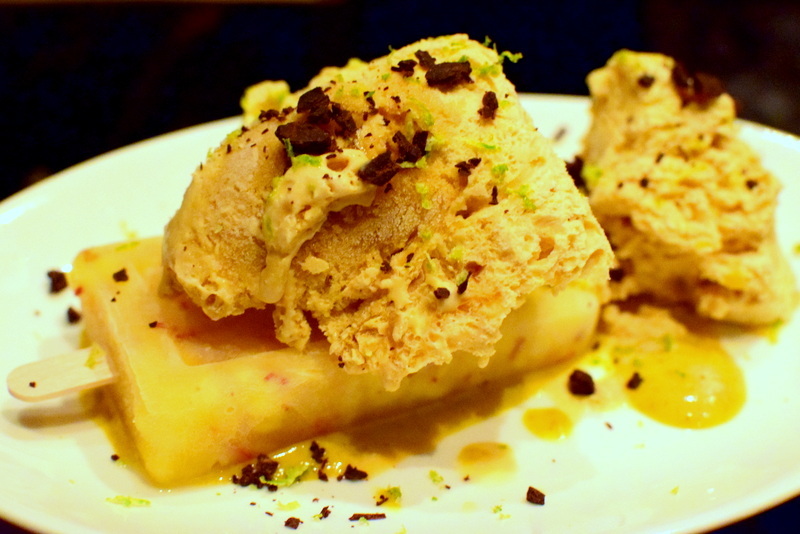 And the next dessert was the chilli pineapple ice pop with gula melaka ice cream. I thought this dish had an odd combination but still tasted very exciting. I was very intrigued by the chilli pineapple ice pop as it gives you a spicy aftertaste while the gula melaka creamy ice cream helps to sweeten things up. $14. 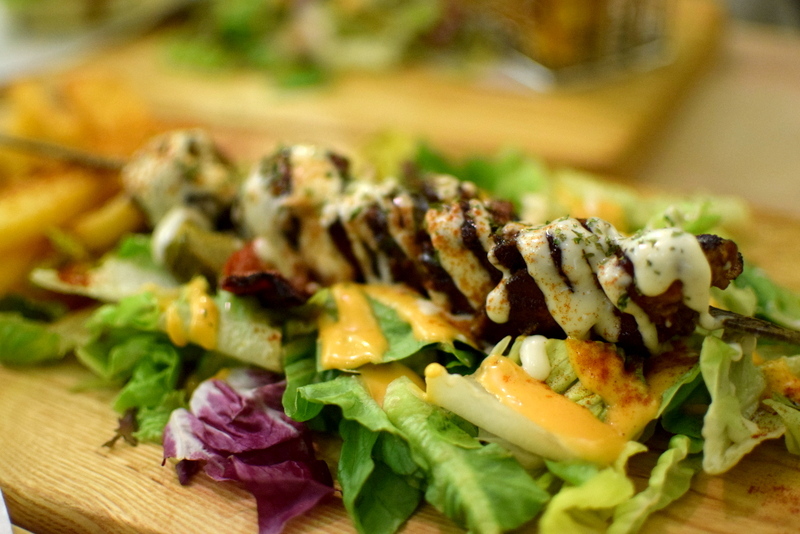 So if you are sick of the usual bar food and are looking for something more exciting, Moosehead kitchen is the place for you as they serve good fusion delicacies. Located really conveniently just outside Telok Ayer MRT, this place is already packed even before 7pm. I like the izakaya ambience that it has, especially when seated at the counter. Service was not bad I thought as they will constantly give you a fresh bottle of tap water.